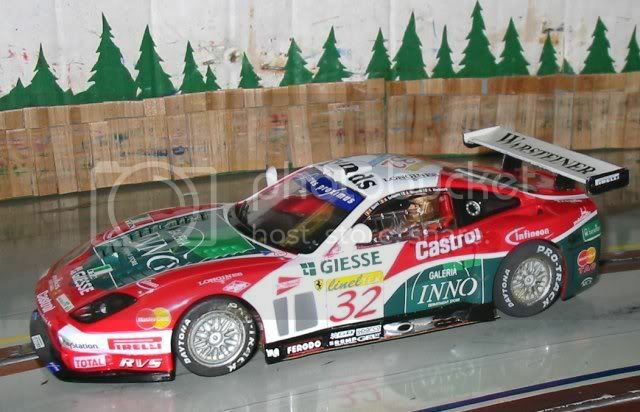 Has nyone converted these to a TSFR 1/24 chassis and has pictures and how to to share? Using Devcon Plastic Welder to assemble all my plastic and resin hard bodies, I can also mount them on their respective chassis by fabricating small bolt nut assemblies. Plastic Welder is an adhesive used by 1:1 body shops to glue plastic and similar materials to metals. ItÃ¢â‚¬â„¢s an incredible adhesive, stronger than any weÃ¢â‚¬â„¢ve found to date. Since the stuff chemically adheres to plastic, the stuff actually makes any glued joint or part stronger than the original plastic body. I drill a hole on each outside pan through which a countersunk 4X40 screw is inserted. I then glue perpendicular to the body inside a plastic mount that will lie flat atop the chassis. I then, after placing the body on the chassis, drill a hole into the plastic mount, aligning the body exactly where it will rest. I then glue to the top of the mount a 4X40 nut which by using Plastic Welder is secure to the plastic mount which is in turn secure to the body inside. I'm sitting here looking at all three and I'm eager to see Dokk's solutions to the 330P4. There must not be much left of the pans and getting the wheel base correct while retaining the front valance probably took some effort as well. I am also curious as to the outer diameter of the tires. Are they to scale, or does it look like a Flexi? The 575 (and Corvette) looks much easier! 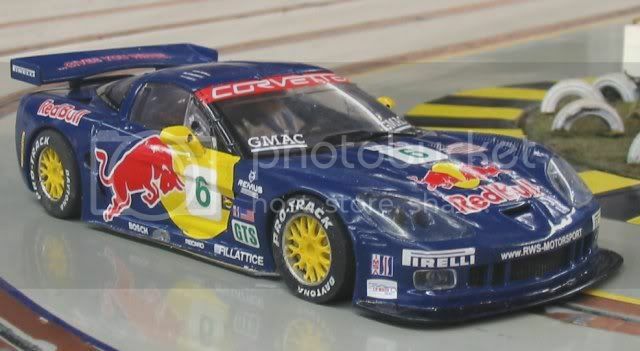 It has the same wheelbase as my Tamiya and TSRF bodies and the track is close but again there are those incredibly tall tires. I found some Pro-Track drag tires that are 1 5/16 O.D. but only .500 wide and they would need to go onto the lathe to accept a scale size wheel insert which would cover the beautiful CNC Barracuda 5/8" (3/32" axle) hubs. I'm not a perfectionist but I think hardbody cars look rediculous if they have too small tires and wheels. Kinda like the Low Riders we see here in the Southwest. Just my opinion, those in the North West don't seem to mind but I'll bet that if good tires were commonly available in correct scale sizes they would run them. I have now made the conversion. You may see it HERE. It's actually very simple for all but the most un-skilled hobbyist. Only The Creator should hack that much off of his progeny! But once He does we all can follow. Except of course for "the most un-skilled" among us. Seriously though it is very cool, I can't wait to see the wheels. Bravo!!!!! A sweet conversion. I have a couple of these beauts, just awaiting the instructions from the master. This should be fun. I should have the thing ready to test at the end of the week. 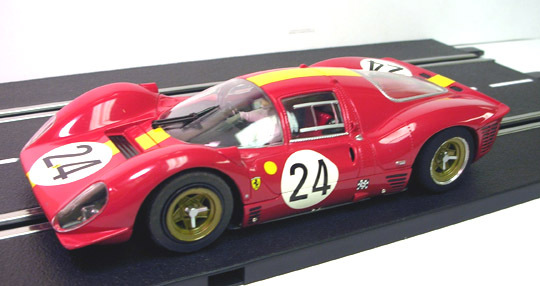 Hi Dokk, any pictures of the wheels and tires for the 330 P4 yet? Here are two pictures of the completed P4 with the TSR chassis, now with wheel inserts made from the Carrera stock P4 wheels, machined down to fit inside the TSR wheels. The car is a joy to drive on the large wood tracks at our raceway, easily keeping up with anything else we got with injected bodies. Gorgeous! You truely are the Master.....However if I had your Bucks, I would have used aluminum wheels front and rear and had them anodized to be a dull , dark gold to match the wonderfully turned wheel inserts. In the interest of authentic reproduction , of course! My budget only allows for cheap enamel paint! I guess I need to get another P4 and another TSRF24 and build one of these. My first one is on the stock chassis with a Slick 7 motor conversion, Indy-Grip silicones and a Jarvic stopping bar mag across the back mag mount. It runs with all but my fastest 1/32 cars on the MagnaTec braid track but is not too good on a big , glue track. I guess I'm ready now to rip the body off one of the Carrera chassis and do something good with it. 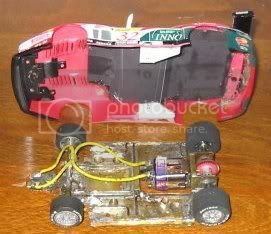 I have in mind a Slick Series S chassis, with Protrak tires and a TSRF motor, and Sonic gears. Or maybe something else. But that beautiful body demands a good-running chassis underneath, and enough motor to really move. Stay tuned for further developments. Once again, Phillippe, a very nice job and an inspiration to scale lovers everywhere. I found that once one adds enough lead to counter-balance this top-heavy car, it becomes a real sweetheart, but still remains "Plafit-like" and at the limit, it will tilt. But the limit is quite far from normal driving, so it is indeed a lot of fun. Just noticed I started this thread in 2006. Well just got around to making the conversion. 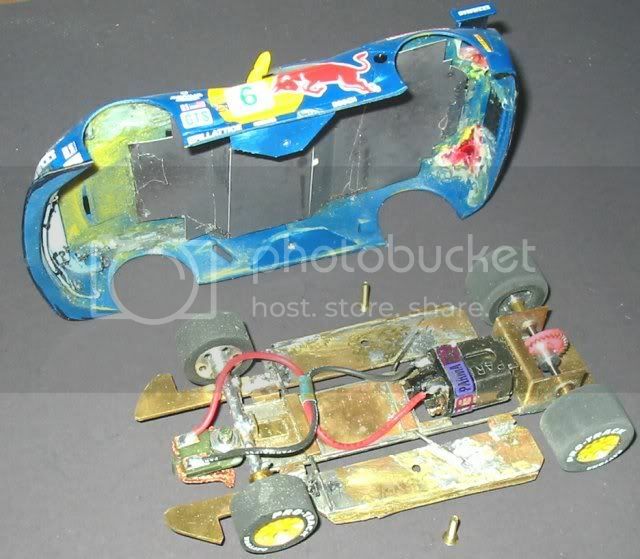 Cut the pans and center chassis section as shown then tried to put the body on. The pin tubing uprights on the pan spread the rocker panels on the body and popped both front and back of rocker panel away from the rest of the body on both sides. In fact one rocker panel popped all the way off of the body. Any recommendations for glueing it back on, model glue vs crazy glue (super glue) or expoy? Also recommendations to make body fit over the pin tube uprights without exerting so much pressure on body in those locations? Do not think it would stay on with the amount of pressure being exerted on the body by the uprights. I do not recommend Crazy Glue on anything made of polystyrene. There are liquid cements that bond the plastic parts together, and that are not only more effective but will not cause crazing around the joints. By any means, NEVER use Crazy Glue on clear parts! Unlike the brand name product called Crazy Glue there are CA glues formulated for plastic. Plasti-Zap is one example. Some clear parts might be glued with this but you risk fogging of the part. It's always a good idea to try glues on a piece of scrap or a place where it doesn't show. I've used Plasti-Zap to add reinforcement using thin fiberglass, carbon fiber, microballoons and baking soda. Using all of them at the same time might be overkill. Remember extra glue adds weight not strength.